Silver skulls on the cover. Stunningly ornate art. Chris Riddell genius. A deliciously dark feast of steampunk bliss. This hardback is a work of beauty, with silver foil skulls edging the cover and incredibly ornate drawings on every page. 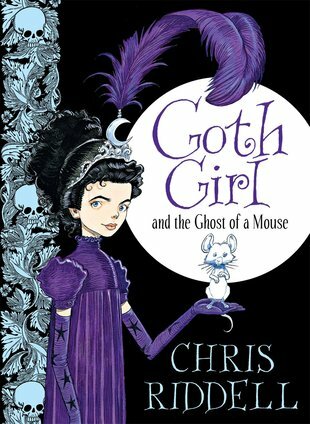 Plus a heroine to die for: the uber-cool Ada Goth, with her fabulous costume of purple feathers and punky boots. (Love the hair, too.) Enter the overgrown gardens and spooky corridors of Lord Goth’s forbidding mansion. Can Ada Goth – the family heiress – and a ghostly mouse called Ishmael solve the sinister mystery of a wicked gamekeeper? I REALLY enjoyed this book as it takes things from real life and changes it to silly things in lord goths little girls world. This story is rigged with excitement and mystery. Can you solve the mystery before goth girl? I have read this book many times and it’s side splitting jokes never get old!! Yet another thing I love about these books Is they all come with something exclusive to the book like the main characters diary. Chris riddle is a wonderful author and has written many wonderful books such as Otto-line and the yellow cat. He also illustrates the books himself so he can really capture the words in the picture. I really recommend this book and all his others.